This Neo-Gothic Revival succeeds in achieving high visual impact with low environmental impact. 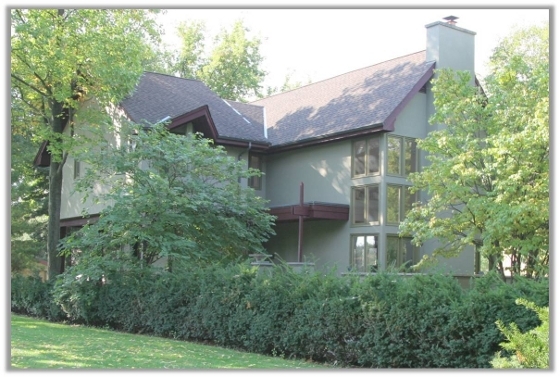 Constructed of Dryvit with cellulose insulation, carefully planned ventilation, radiant heat and double-paned windows, this home was designed to meet contemporary standards of energy efficiency while providing optimal comfort. Its permeable driveway alleviates the potential stresses of excess rainwater on the foundation and the sewer system. Rainbarrels enable capture and reuse of rainwater run-off from the roof. The current owners are in tune with the home’s environmental ethic and have incorporated reclaimed and recycled objects into their home and gardens for an effect that is at once intriguing and serene.